President Donald Trump revealed his 2018 budget proposal on Thursday seeking approval from Congress to bolster military spending at the expense of environmental and foreign aid programs, and to begin building a wall along the Mexico border. Trump’s budget is looking at Congress to allocate $3.1 billion, over two years, toward the wall along the southern border with Mexico. 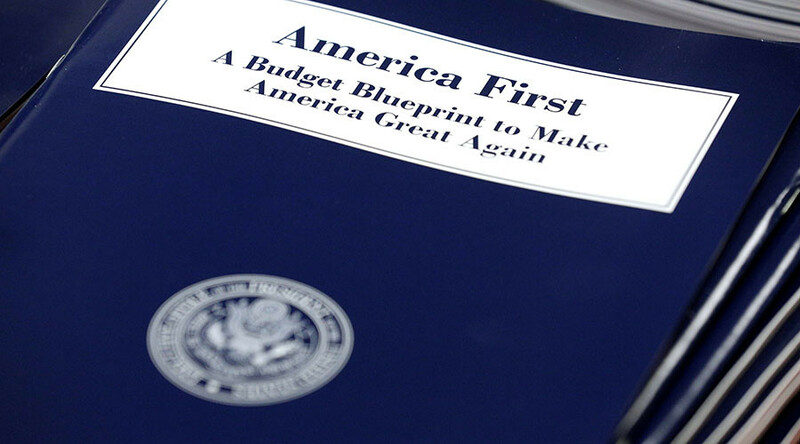 “America First: A Budget Blueprint to Make America Great Again” outlines Trump’s plans for discretionary spending for next year’s federal budget, which starts on October 1. Trump, in a letter to Congress, said he aims to advance "the safety and security of the American people," which he hoped to achieve by raising $54 billion in added military spending next year. Trump’s plan does not include an increase in the federal deficit, which stands at $488 billion. The budget, however, doesn’t include programs like Medicaid and Social Security which will be released in the full budget plan expected in May. "The president wants to spend more money on defense, more money securing the border, more money enforcing the laws, and more money on school choice, without adding to the deficit," White House budget director Mick Mulvaney told reporters on Wednesday. Trump wants $1.5 billion for the infamous border wall this fiscal year — to initiate the project — with $2.6 billion requested for the 2018 fiscal year, which begins October 1. The full estimate for the wall is expected to be in the full budget. The proposal allocated an increased defense budget of $54 billion. “This increase alone exceeds the entire defense budget of most countries, and would be one of the largest one-year DOD increases in American history,” the report reads. Trump has also requested an additional $30 billion for defense for the rest of 2017 fiscal year, with the $1.5 billion for the wall to come from that pot. The Department of Homeland Security is supposed to get a 6.8 percent increase in funding, which is slated for deportations and detaining illegal immigrants, including hiring 500 new Border Patrol officers and 1,000 new Immigration and Customs Enforcement (ICE) officers. As expected, the Environmental Protection Agency and State Department face the biggest cuts. The EPA is targeted for a $2.6 billion cut, 31 percent of its budget, while the State Department will lose 28 percent, or $10.9 billion. Foreign aid, development grants, and climate change programs will be affected by the slashed budgets, with 50 EPA programs targeted by Trump, but Mulvaney assured reporters that the “core functions” of those departments would be preserved. The Education Department would see a 14 percent trim in its budget, but it will receive $1.4 billion for public charter schools and private schools investment. At a time of massive inequality, we shouldn't slash programs for seniors, children and working people to increase military spending. The plan doesn’t focus on Trump’s promised $1 trillion investment in infrastructure. The White House said it is still to come. Community development grants at the Housing Department, 20 Education Department programs, anti-poverty grants and a program to help poor people pay their energy bills have all been earmarked to be slashed. The Agriculture Department is set to see a 21 percent cut in spending. The budget plan is just the first step for Trump, as Congress will have to approve the measures. Budget resolutions must pass both the House and the Senate, which involves subcommittees, before the budget is finalized. Democrats are likely to oppose much of the cuts. However, Republicans have already raised issues with proposed cuts to programs like home-heating subsidies, clean-water projects, and job training.